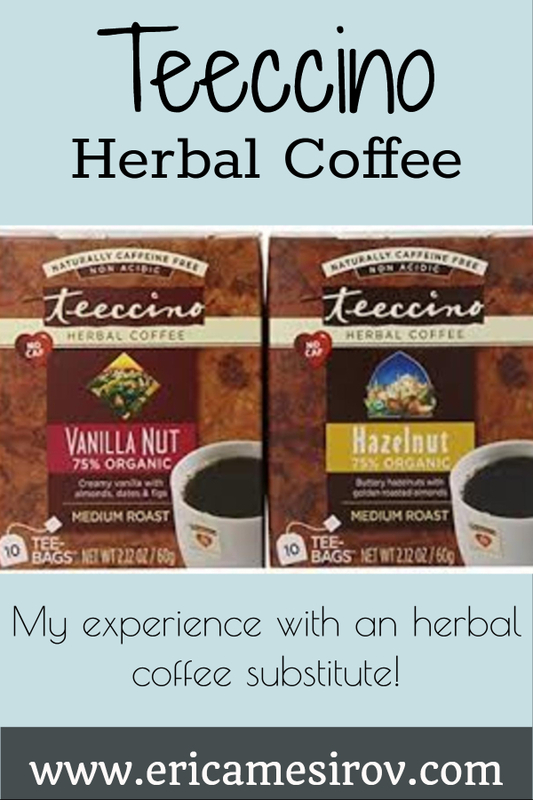 Teeccino Herbal Coffee Review (Caffeine-Free Coffee Substitute) - Eat. Lose. Gain. As you may know, I’m not supposed to drink coffee. This is due to my history of Fibrocystic Disease and zapped out adrenals. But oh my gosh, I LOVE it! Truly. So I compromise. Sometimes I drink coffee. And sometimes I choose things like Teeccino herbal coffee. The reality is that I don’t just love coffee for the buzz. I love the way that it feels in my hand. I adore the aroma and warmth on a cold day. And there’s something about the ritual of preparing and sipping coffee that makes me feel relaxed. So while I love drinking the real stuff, I don’t always need it. And that’s where something like Teeccino comes in. It allows me to feel like I’m drinking coffee without messing up my adrenals and adding stress to my already stressed-out lifestyle. Teeccino is a coffee-like beverage made from healthy ingredients. You can brew it in a tea bag, like a tea. Or you can brew it in your coffee maker. But the finished product tastes very similar to coffee. And once you add your favorite creamer, you may not tell the difference. Teeccino is made from brewing whole, nutrient-rich foods. We’re talking the likes of dandelion root, chicory root, almonds, dates, and figs. So this herbal coffee is a beverage you can actually feel positive about drinking. Most of us carry way too much stress. I’ll admit that I’m guilty. And we might not think of a caffeine buzz as adding to that stress. But the reality is that it does. Caffeine acts as a central nervous system stimulant. It does help keep you awake. But it also speeds up your heartbeat, increases blood pressure, and boosts irritability. Kind of mimicking the effects of emotional stress. It can even lead to diarrhea and fertility problems. So while a little caffeine can make you feel good, lots of caffeine can make you feel very bad. And some people feel best when they have no caffeine at all. Take a one week break from caffeine and you might be very surprised with what happens. When I first saw Teeccino, I was very skeptical. I’m not a huge tea fan. And this sure as heck looked like tea to me. But knowing that I’m not supposed to drink caffeine, I decided to throw caution to the wind. The first variety I chose was my favorite – french roast. So here I was brewing french roast “coffee” in a tea bag. Did I mention I was super skeptical? I let it steep for about 5 minutes. When it was done, my beverage had that deep dark brown, full-bodied look of coffee. But did it taste the same? Well, I wouldn’t say it tastes EXACTLY the same. But it tastes very similar. And once I added my coconut/almond milk creamer, I could swear I was drinking coffee. If flavored coffee is your passion, there are lots of different options to choose from. They have the full coffeehouse variety of flavors. Think pumpkin spice, vanilla, hazelnut, mocha, and caramel. But if flavored coffee isn’t your thing, there are quite a few pure coffee varieties as well. I’m talking about regular java, dark roast, and of course french roast. There’s something to replicate any of your favorite coffee options. If you’re staying away from gluten, then the dandelion varieties of Teeccino are your best friend. Because dandelion is an herb that’s gluten-free. And the dandelion line of herbal coffee comes in lots of fun flavors. 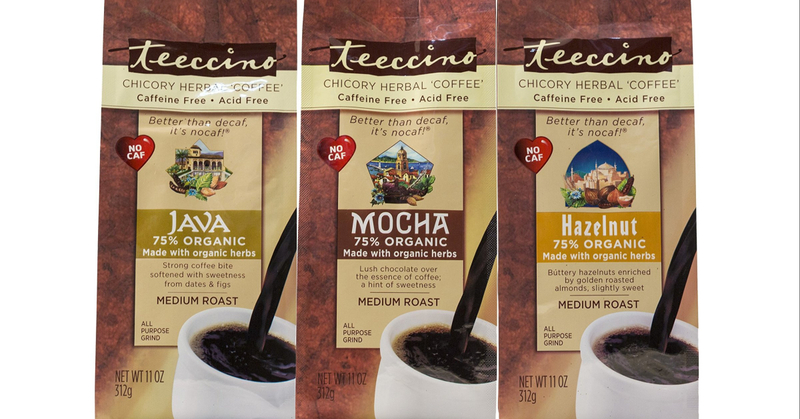 The other varieties of Teeccino also test as gluten-free when brewed in a tea bag. But the reality is that the non-dandelion Teeccino contains barley. So you probably don’t want to risk it if you’re truly celiac. If that’s the case, stick with the dandelion. I would not recommend going cold-turkey on coffee if you’re currently a heavy coffee drinker. You’ll likely get a horrible headache and other withdrawal symptoms. Caffeine is a drug of sorts. I would include Teeccino in a couple of ways. Either substitute your afternoon coffee for Teeccino. Or drink half a cup of coffee mixed with half a cup of Teeccino. This is a way to reduce your caffeine intake and make your beverage routine more healthy. So check out the full line of Teeccino. And if you’re new to their site, use the discount code healthyliving2018 and you’ll get a 10% discount! Balance this in with your daily coffee, and watch your stress levels go down as your energy goes up! Teeccino herbal coffee is a great option for those who cant drink “regular coffee” like yourself or even those of us who just don’t like coffee. People always think it is so strange that I dislike the flavor of coffee but I bet I could easily find a flavor of Teeccino herbal coffee that would be good to start my mornings. Plus I love all of the added nutrients and health benefits that come with Teeccino herbal coffee. Don’t you just love dupes? They are the best! So glad you have something similar to cofee!! This looks very interesting. I’ll to look for this product for my dad, he likes to drink coffee but caffeine doesn’t effect him. This sounds like great options!! Yes, WE ARE ALL TOO STRESSED these days, I have noticed when I cut back on caffeine and I substitute in for natural sources of energy life seems smoother and happier I can solve problems better with a clearer minds! I have never tried the herbal coffee. And the post is convincing how beneficial they are!